This is a guide about use wine bottles in stained glass. 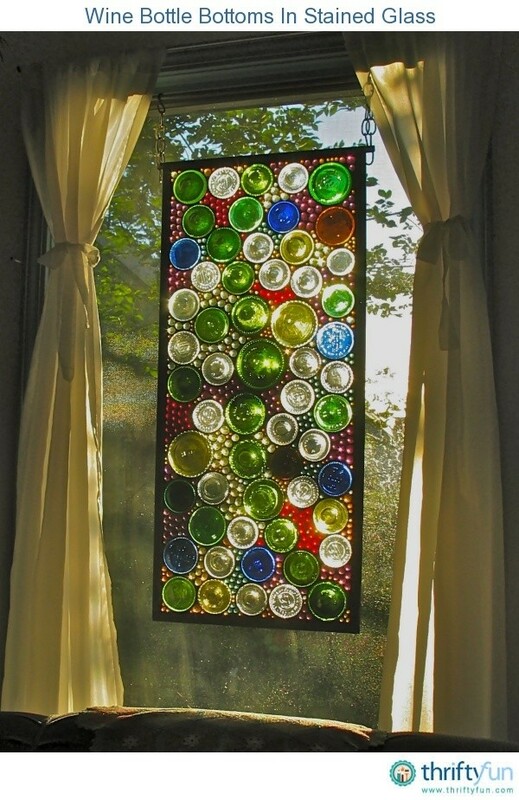 A bottle cutter can help you reuse glass containers to create beautiful projects. I work with stained glass a lot and often use the bottoms of wine bottles in my windows. The bottles with the pushed in bottoms look really cool with the sun shining through. It's a fair bit of work to get the bottoms cut and shaped for use, but well worth it. Check on YouTube for several different ways to do this. I have over 30 years experience working with all kinds of glass and have cut up hundreds of bottles. I've been cutting glass for over 30 years now and the steel wheel cutters are junk. They get dull after only a few cuts and then you wonder why you can never get the glass to break properly. If you are going to cut glass, get a good carbide wheel glass cutter with an oil feed. The carbide tip will stay sharp and the oil feed lubricates the score. However, they don't sell them at the local hardware store. The cheap steel cutters cost $5 to $10. A good carbide glass glass cutter only costs around $25 to $30 and you will save ten times that amount by having less broken glass, not to mention all the frustration that it will save you. 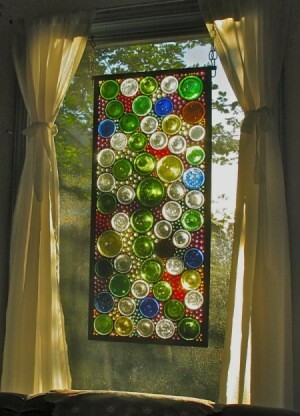 What do you use to connect the wine bottle bottoms and glass pieces together for the stained glass piece? It does not look like grout. Check your local library for books on making stained glass pieces at home - the books will have complete guides including the materials you'll need, and will show you how to cut glass (and wine bottles) safely. To put the bottle bottoms together in a stained glass piece, you're also going to need to understand the principals behind supporting the weight of the bottle bottoms, and what materials are used to hold the bottoms together - usually lead came (a channeled tube of lead in long lengths) or 'copper foil', a technique done with a soldering iron and a roll of lead solder. For starters, after the books, you're going to need a good quality glass cutter, a bottle cutter (a different tool than the glass cutter), a soldering iron and associated materials (lead came, copper foil, lead solder, flux and flux brushes, a stand for the VERY hot soldering iron, and a heat-fire proof mat for use whilst applying the solder). There's a lot more, so be sure to borrow or buy a good book before investing in any other materials. Stained glass is a somewhat expensive hobby to get started in but if you think you would enjoy making numerous pieces for sale or gifts, it's well worth the work! Otherwise, support your local artisans and buy from one of them - look in your telephone directory for stained glass artists. If the bottle bottoms are sentimental, many artists will work with those and charge you for the glass work to assemble your vision for you - might be less expensive than putting together the kit to make it yourself.